Two years ago Marie Lu came to town for her Rose Society tour and when asked if she was working on anything new she talked about a sci-fi story set in a world where doing everyday things in real life got you points in a video game. She didn't talk a lot more about the plot and seeing as I'm not really an avid gamer I remember thinking that it was an interesting idea and that I would add it to my goodreads but who knows if I would pick it up when it finally came out. When I heard she was coming back to my city for that book she talked about I decided that I would definitely pick it up, and in the end I'm really glad I did. As I said above, video games aren't really my thing. Sure, I've played some heated rounds of Mario Cart and jammed to some Guitar Hero but I never really got into it like some people do. That means when I say that the gaming elements in the book were completely accessible I'm not saying it as someone who spends hours playing D&D or first person shooters, but as someone who once managed to find a glitch in a Halo game and spent 10 minutes trying to jump out of a hole to no avail. Aside from being accessible though, the gaming aspect or I suppose more so the virtual reality aspect, made for some really cool settings because Lu could pretty much do whatever the heck she wanted. If she could dream it up, it could fit somehow because parts of the book took place in virtual reality video game levels, which can get pretty crazy. Lu also included a fantastic cast of characters that were not only wonderfully diverse but believably so. That might sound weird, but I've read a few books recently where the diversity seems...forced because it's mentioned over and over again as if it's trying to shout "look at me, I'm diverse!" and thus doesn't seem natural. Here it's mentioned once or twice but after that it just is. Not only does Lu not focus on it, no one else in the text does either. 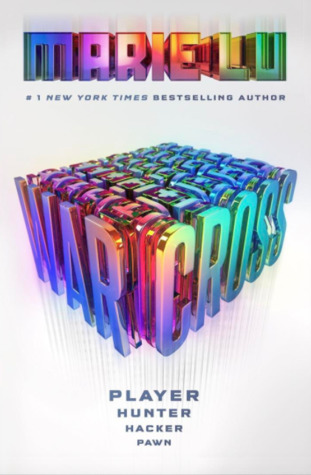 The various players are both male and female, they speak several languages, have different skin colors, and it's even insinuated that they're not all straight, but it doesn't matter because they're top Warcross players first and foremost, as it should be. The STEM aspect is also fantastic. Emika is a pretty great hacker and the fact that she's a girl is fantastic for representation but as far as the story goes it doesn't matter. The last thing I feel the need to point out is that Lu hits the sci-fi genre out of the park. The world, our world, is both recognizable but different. What's more though, is that the story raises questions that make you think and that don't necessarily have straight answers. 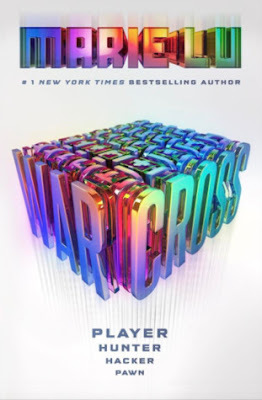 To me that's what a good sci-fi story should do, it does something that makes you uncomfortable while also forcing you to see both sides of a coin, and Warcross nails that aspect perfectly. Honestly there's not much I didn't like about this book. There were one or two things that I guessed long before the reveal came, but it wasn't like this was a mystery novel, so it's not that big of a deal. The one thing I did find somewhat irksome was how Emika talked about coding. I'm not sure I'm convinced that you could actually code, or find problems in code, the way Emika does. In the grand scheme of things though, it made coding (something that is actually really difficult) easy enough to understand on a base level, so I can't really fault Lu for that, seeing as actually going into detail about any of it would have bogged down the story immensely. Overall Marie Lu seems to have done it again. She's written a book that's sure to appeal to both boys and girls (males and females?) that not only feels like it's in the realm of possibility for our future but is also filled with emotion and suspense. It certainly cemented the fact that she's an expert at giving you fuzzy feelings only to stab you through the heart at the last minute, so beware of that. That does seem to be the only connection between all of her books though, because if you were looking for something reminiscent of her previous series I don't think you'll find it here. With that if you have even the slightest interest in this book I would highly recommend picking it up and reading a chapter or two. The subject matter isn't going to be for everyone, but I don't think anyone will have trouble grasping what's going on regardless of how tech or game savvy you are, so don't let it scare you away just because you don't know anything about the source material. Thank goodness I took a chance on this book because now can't wait to see what the second book (and hopefully the last in the series) brings next year!